IDF's Foundation Day event received wide coverage in MangaloreMithr news portal. IDF Thank MangaloreMithr team for the continued support. "I feel very happy in presenting the voluntary contributions made by my students for leprosy/ TB and education cause this very day which happens to be the centenary birthday of Mother Teresa who served for the cause of leprosy", said Dr. Vandana Lulla, Director of Podar International School as she presented donations to Dr. Narayan B. Iyer, CEO, IDF. Mrs. Shahina Momin, Co-ordinator of the school felt happy about the students participation in social responsibility programmes of IDF. Dr. Narayan Iyer thanked Podarites for the kind and continued support. Vibgyor High's Student Social Responsibility Cell came out with a novel idea of organising business games among the school students and share the profit arising out of it for charity. Vibgyor High team decided to present the donation to Indian Development Foundation for its social objectives. The team has been coming up with new ideas and supporting IDF projects for a couple of years now. Mr. Shim Mathew, Principal of the School, Ms. Rina Biswas, Business studies teacher and the team presented a profit to Dr. Narayan B. Iyer for IDF's education projects. Dr. Narayan Iyer appreciated the novel idea of students and congratulated the emerging business tycoons with a social bent of mind. India’s progress in leprosy eradication efforts has been spectacular and the participatory work by governmental and voluntary agencies is laudable, observed Lt. Gen. Ajai Barnabas Masih, UYSM in Mumbai on Wednesday. We are happy that the cherished dream of the Father of our nation for leprosy elimination has come true, he added. 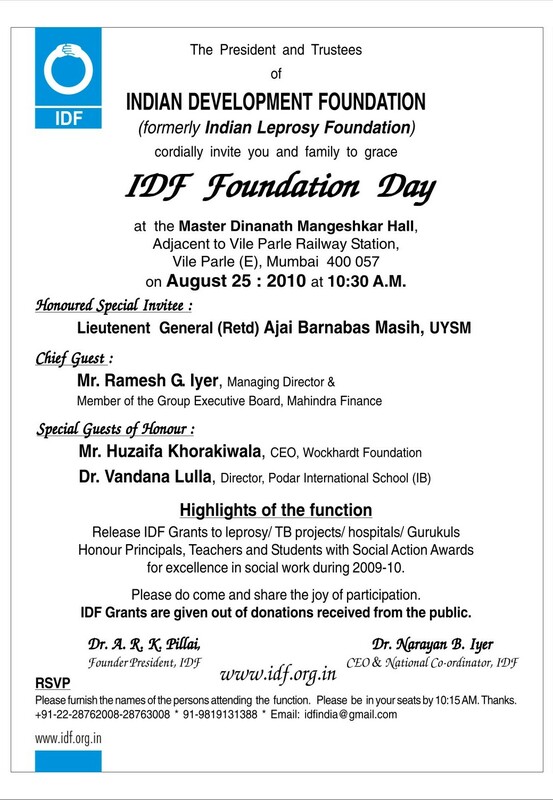 Lt.. General (Retd) Ajai Barnabas Masih was speaking as the Chief Guest of Indian Development Foundation’s (IDF) Foundation Day Function at Master Dinanath Mangeshkar Hall on 25th August 2010. He gave away IDF Grants to leprosy/ TB hospitals and projects in western region. The Chief Guest also presented Awards to 27 Principals of Schools in Western zone with star performance record of leprosy awareness programmes and resource mobilisation and awarded Medals and certificates to 199 students for their signal contribution. Prestigious MOTHER TERESA MEMORIAL AWARD 2009-10 was presented to R.B.K. School, Mira Road, for outstanding resource mobilisation for leprosy/ TB work in western zone. IDF SOCIAL ACTION AWARDS 2009-10 were presented to 23 Principals and 18 Teachers for their excellent Social Responsibility during 2009-10. IDF Dynamic Supporter Award was presented to Wg. Cdr. S. Balasubramanian Vr.C., while IDF Social Ambassador was presented to Mrs. Neeta Kirit Sanghvi and Mr. Anil Shivdasan. IDF CSR Awards for 2009-10 were presented to Bank of America, Educomp Solutions Ltd. and Halliburton for their excellent participation in social responsibility programmes of IDF. Mr. Huzaifa Khorakiwala, CEO, Wockhardt Foundation and Dr. Vandana Lulla, Director, Podar International School were the Guests of Honour for the function. They complimented Indian Development Foundation’s role in India’s fight against leprosy/TB and for widening its activities to include health care, education and development. Dr. A.R.K. Pillai, founder President of the Foundation presided over the function. Wisdom Band added symphony to the entire programme while students of Vivek Vidyalaya, Goregaon (W) rendered the invocation prayer. NSS Volunteers from Vivek College of Commerce co-ordinated the event. 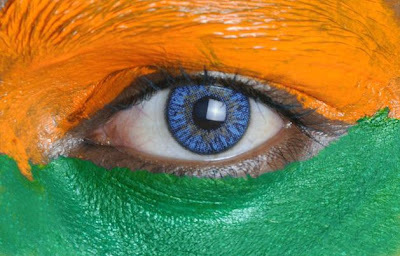 Samarpita Mukherjee-Sharma speaks to Dr Narayan B Iyer, CEO and National Co-ordinator of Indian Development Foundation [IDF – formerly Indian Leprosy Foundation] about the campaigns they have taken up in the last 27 years. “IDF is a non-governmental organisation (NGO) which has neither sought nor received any government financial grants. IDF is not supported by any major foreign donor agency either. The Foundation believes in self-reliance and raises its own funds through public appeals,” informs Iyer. Indian Development Foundation organised a 3-Day health camp for the students of J.D.Bharda School, Grant Road, Mumbai. Medical Interns from Bharati Vidyapeeth University and Dental College, Kharghar helped in the medical camp. Vivek College NSS Volunteers did an excellent job of co-ordination in organising the camp. IDF Ambassadors- Dr.Sharad Nayampally, Ms. Urja and Ms. Asma helped in the camp. IDF thank Wg. Cdr. 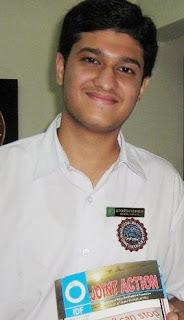 S. Balasubramanian for supporting iDiscover 2010 Project. iDiscover 2010 is an IDF initiative to inculcate scientific temper in young minds. For more pics and details on iDiscover click the link given below. Rotarian Sana Rupani from Rotary Club of Mumbai North End led a group of Innerwheel and Rotaract Club members to Vimala Centre to celebrate Friendship day with a difference. Innerwheel Club President Mrs. Kashmira and Secretary Mrs. Urmila felt happy as they tied friendship band on the hands of the inmates. Roteract Club President Swadesh and Secretary Tanvi expressed their joy and happiness as they distributed sweets and tied blue friendship band on the hands of Vimala Centre children. IDF team - Dr. Narayan, Mrs. Uma, Mr. Keshav and Ms. Helna co-ordinated the event. Rev. Sr. Hubert from Vimala Centre expressed special thanks to the Rotary Club members. Rotaractors included - Swadesh Shelar, Tanvi Moolur, Mangesh Jadhav, Suraj Pal, Nilaksh Agarwal, Abhishek Tiwari, Sachin Shigwan and Divya Malvankar. Trib Local from Chicago reports IDF news. Mr. Ramesh G. Iyer, Managing Director & Member of the Group Executive Board of Mahindra Finance received Dr. A.R.K.Pillai and Dr. Narayan B. Iyer from IDF on 4th Aug. 2010. Mr. Ramesh appreciated the work of IDF in the areas of health, education and rural development. `It is heartening to learn about students role in supporting IDF nation-wide programme and I wish congratulate young children for their social participation', said Mr. Ramesh. 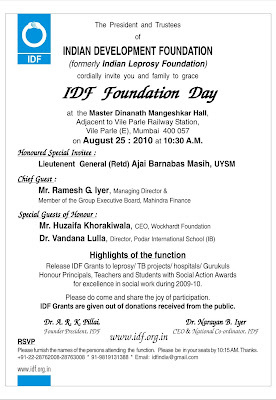 Mr.Ramesh expressed happiness to participate in IDF Foundation Day function scheduled on 25th Aug. '10 in Mumbai. Mrs. Rekha Bajaj, Area Manager, Educomp Solutions Ltd. visited IDF office on 4th Aug. 2010, along with Wg. Cdr. S.V. Choudhary, Sr.Manager HR & Admn. HVPS International School and Mr. P. K. Saxena from ONGC. While the visiting team expressed their happiness on meeting Dr. Pillai, they assured their support and co-operation in the social responsibility initiatives of the Foundation. Dr. Pillai and Dr. Narayan thanked Mrs. Rekha Bajaj for sponsoring a student in IDF Bal Gurukul. .....................While Utkarsh Rastogi, class XII student, Bhavan Vidayalaya, IDF social ambassador, spent four days shooting the schools in Jaipur villages. "The purpose of these schools, established by IDF, is to take education where it's not there. While shooting we spent four days with the students waking up around six, travelling 7-8 kms. "We'd first spend the entire day scandalising the students with the camera." He adds, "The purpose of the documentary is not to ask for more donations but to inform people what we are doing." There are plans in place for future too, for shouldn't the show go on, shouldn't the reel stop rolling. Adds Utkarsh, "In another two weeks I'm off to join the University of Illinois but around December is lined up another NGO in Rajasthan that's working for leprosy patients. People here get training for free in fields like electronics, auto repairing, tailoring. I want to pick up two three people and tell their story."